Easy Air Fryer Lemon Garlic Salmon Recipe – delicious crispy and flavorful air fried salmon packed with tons of lemon and garlic flavor in under 12 minutes! 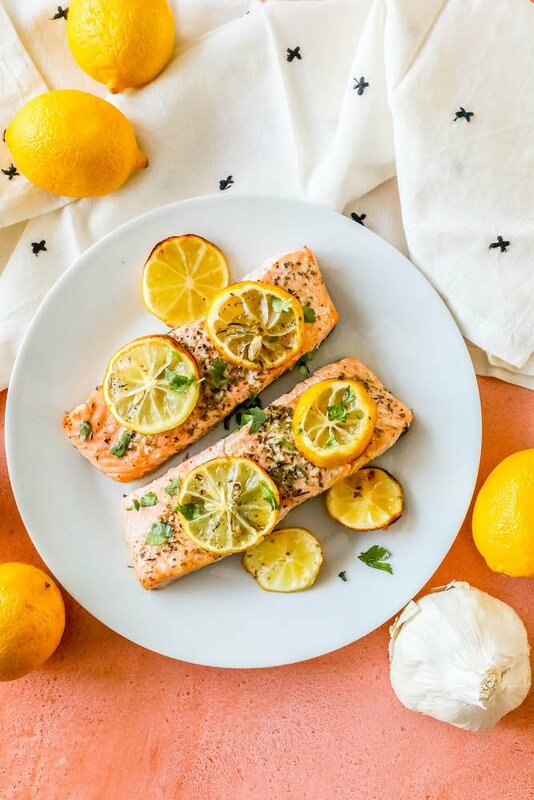 This lemon garlic salmon has the most amazing flavor – and you’ll be shocked just how easy it is to get. If you can season salmon filets and pop them in an air fryer – you can master perfect, tender, and juicy salmon that isn’t tough or dry – and is BURSTING with lemon garlic flavor! 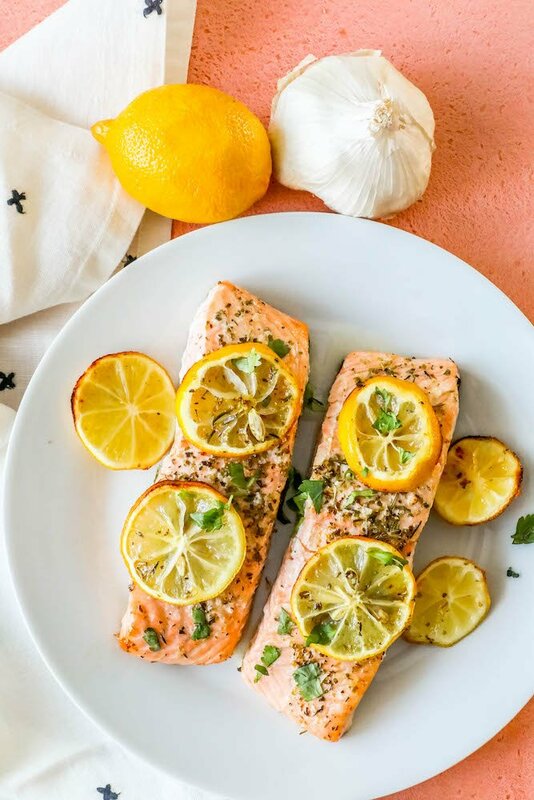 This easy lemon garlic salmon can’t get any simpler when you want a healthy, beautiful dinner in no time – with almost no work. 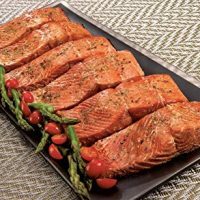 Even if you don’t have an air fryer you can make this salmon in a snap – I’m providing a super easy foil pack oven option below as well! I hope you love this delicious, naturally low carb and keto salmon recipe as much as I do. It’s a perfect elegant dinner you can make any day of the week, and fits in most diets! 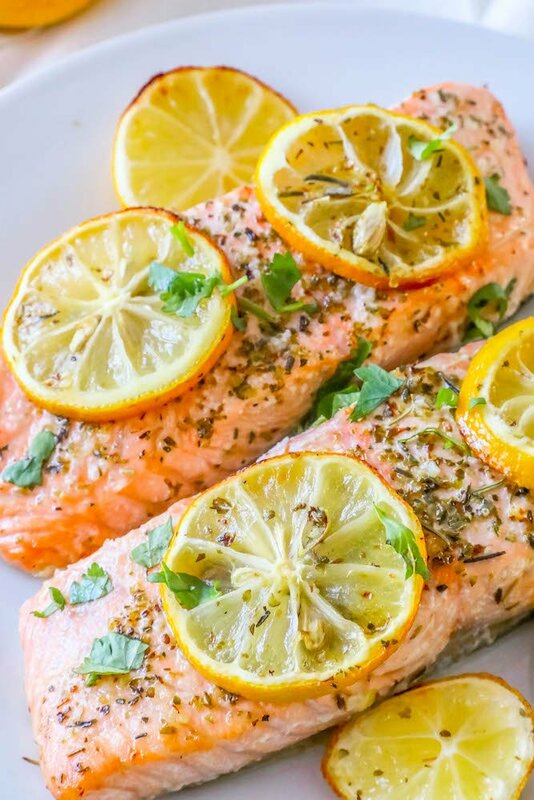 Just Take Me To The Easy Air Fryer Lemon Garlic Salmon Recipe Already! If you’d like to skip over my helpful tips and tricks and get straight to the easy air fried salmon recipe, please scroll to the bottom of the page where you will find my easy printable recipe. I get lots of comments and questions from readers on my recipes, so I try to provide as much information as possible for them. If you’ve never used an air fryer machine before, you might not get the fuss. I will note, however, before we get into this recipe more, that the name “air fryer” is a bit misleading – since nothing actually gets fried in oil. Instead, it’s more like a super-convection broiler – where food is bombarded with quickly moving super hot air, mimicking the way food would fry in hot oil, but on your countertop with only a bit of oil. This allows you to cook at a steady high heat with less oil – giving you crispy crunch on the outside, and juicy, tender, and never dry meat. Air frying salmon is a great way to cook your salmon perfectly, every time! 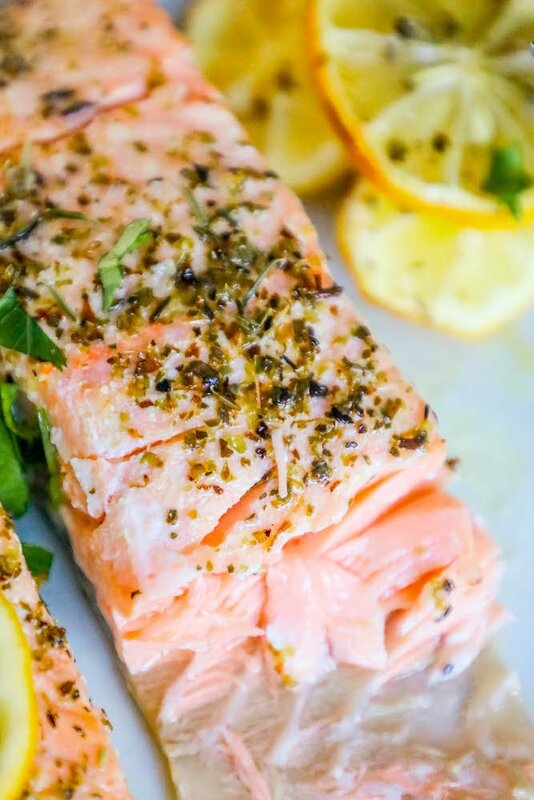 -Drizzle olive oil over your salmon evenly. This will help give your salmon a lightly fried texture and allow the oil to crisp on the salmon. Don’t skip the oil! 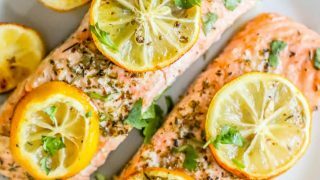 -Arrange lemons to touch salmon while cooking. 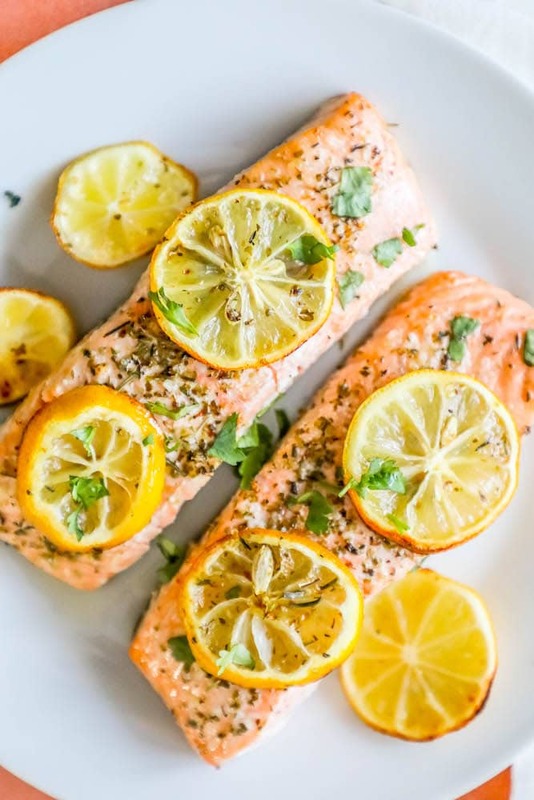 The lemons break down quickly, dousing your salmon in lemon juice that is sweet and tart, not bitter. When I pulled salmon out of my air fryer for the first time, my heart sank, because the top looked to be very overcooked (covered in white). That’s just how the salmon looked on top – the meat within, however, was soft, full of flavor, and perfectly cooked. Knowing how long to cook air fryer salmon can be tricky – especially since when cooked in the air fryer you can’t see it. This is a recipe where you have to trust in the process – which I will admit is not my strength! -10 Minutes for salmon filets that have just a little bit of red in the very center (medium). -12 Minutes for salmon with no red in the middle, but still soft. -14 Minutes for well done salmon filets. If you think this recipe looks great – but you dont have an air fryer – no worries! You can easily make this recipe in the oven, too. 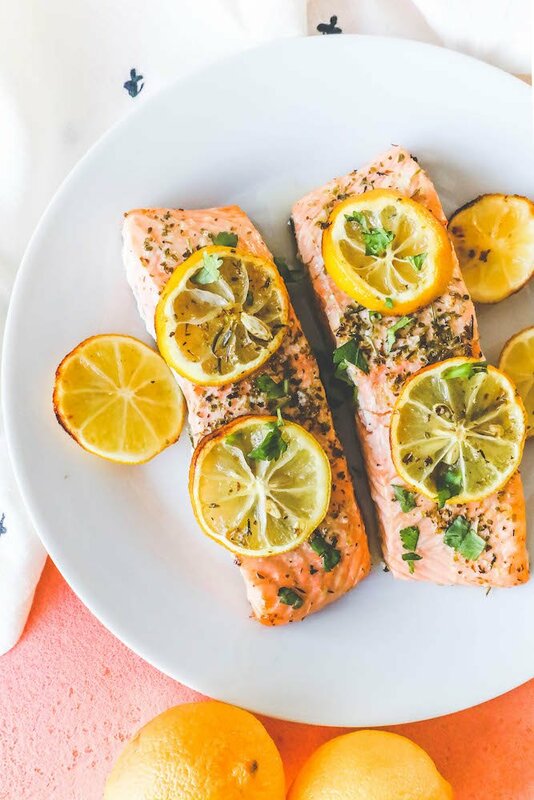 Simply wrap the salmon and lemon in foil, and bake at 375 for 15 minutes, until top is speckled white but albumin (white fat) has not released. If you love this easy air fryer lemon garlic salmon recipe as much as I do, please give it five stars and help me share on facebook and pinterest! Easy Air Fryer Lemon Garlic Salmon Recipe - delicious crispy and flavorful air fried salmon packed with tons of lemon and garlic flavor in under 12 minutes! In a large bowl, drizzle lemon juice and olive oil over salmon and rub to make sure the salmon filets are evenly coated. Season generously with salt, pepper, and Italian herbs. Arrange salmon filets in air fryer basket, making sure they dont touch too much (don"t over crowd the basket, so air can move around salmon easily). Arrange lemon slices on and around salmon in air fryer basket. Set air fryer to 400 degrees and cook for 10 minutes for salmon with a little bit of red in the middle. Cook for 12 minutes for salmon with no red in the middle, 14 for well done salmon or thicker salmon filets. I love how easy and delicious the air fryer makes this salmon! So delicious! Love that lemon flavor! I LOOOOOOOVE the air fryer!! I can’t wait to try this as I already have all the ingredients! Delicious! I bet this salmon just falls apart and has tons of flavor.